The Golden Orfe, or Ide, is a somewhat overlooked choice as a fish to stock your pond and water garden with these days; yet the Orfe is an easy to find and affordable pond and water garden fish. Most pond fish dealers stock the Golden Orfe because they know about its hardiness, interesting behavior, and easy upkeep when it comes to our backyard pond installations. The Golden Orfe, Leuciscus idus, has been in the United States for over 100 years now, originally introduced to stock estate and farm ponds. Their beauty was surely a consideration back then when stocking those early ponds; but their impact on insect control (water quality) was equally or more important. Now, they have found their way into today’s backyard designer ponds and water gardens, but this line of fish is a really old one. Leuciscus idus was described by Linnaeus himself, the “Father of Taxonomy” back in 1758! Keeping the Golden Orfe is like keeping a bit of pondy history. The native territory of the Orfe is in European and Asian rivers and large lakes, Russia to Mongolia. The territory of the wild Orfe has spread worldwide and today the “domestic” Golden Orfe can be easily be found at most local pond and water garden retailers, and online sellers, but buying them in person is always more fun. The golden Orfe are a long and slender fish, but they are deep bodied. The Orfe can get pretty big too, at 20” or so and weighing in at 4 pounds. They are a very solid looking fish when mature. Their color is a golden orange mix, but I’ve seen them look yellowish, and even pale pink. They like to be in schools/shoals and are best displayed that way since they like to constantly swim just under the surface of the water. They move grouped together and rarely will break away solitary. Their natural diet is crustaceans, worms, snails, and even small fish; so they are considered predatory. However, the Golden Orfe that we keep in our ponds are well acclimated to taking prepared foods. This is not to say that instinct does not kick in if they are hungry, and just the right size little fish happens in front of them, and any insect landing in the pond does not have a chance. Give them treats of krill, or earthworms from time to time and they will love it. Before koi hit the market, the Orfe and goldfish were battling for first place in the hearts of yesteryear’s pond keepers. Then koi came along and messed up their whole day; so the Orfe has been a little forgotten about by today’s pond keepers. Good news is that koi, goldfish, and Orfe can all stay in the same pond together. The Orfe is not an aggressive fish. They do like a lot of oxygen so a pond or water garden with a waterfall would be well suited for keeping them. Orfe will successfully spawn in our ponds and water gardens. Their courtship involves aggressive behavior which is normal; so if you see a lot of sudden chasing and splashing, that’s probably what’s going on. Aaah, romance in the pond (romance occurs intermittently, March thru June). Usually not that many baby Orfe actually make it, but year after year you’ll see more Orfe in your pond. Golden Orfe can live 20+ years in captivity. The Orfe is definitely better kept in larger ponds, 800 gallons+. Everybody loves to tell a fish story and here is a fish that has a story built into it. Leuciscus idus, the Golden Orfe shares a long history with people who keep fish in ponds and water gardens…like you. Think about it, Carl Linnaeus himself, in a frenzy of scientifically describing everything within his reach; shoved his hand into the water, pulled out a Golden Orfe, and found it worthy of some of the earliest scientific descriptions of the animal kingdom. If you haven’t kept Orfe and you have the room in your pond, head out to your local pond and water garden fish retailer to find yourself a few. Tell them the LOVEYOURPOND BLOG sent you. My wife and I have had orfes for 17 years successfully, including a few babies along the way (they did survive). It was looking up the correct spelling for orfe did we come in contact with your info and discover the complete name Golden Orfe which we had not known all these years. Hi Mike, I really liked the information on your blog. Thanks for that. 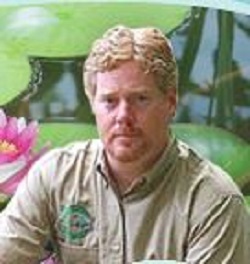 Approx 8 yrs ago I bought 10 3-4 inches golden orfes. Today, around 6 in the evening, for the first time, I have seen them spawning. I would like advice on Do’s & don’ts to successfully hatch/keep some baby orfes. I have got butterfly Kois and goldfish, shubunkins, & common carps in my pond all living happily together. 07843256902. We have 9 large orfe in our large garden pond, which have successfully lived through at least 4 winters. But they have not yet re-appeared (5th. April 2018). There is a shelf in the pond on which we grow plants and they often hide under this. Do you think they will re-appear soon, or maybe the heron has got them? Hello Sarah, thanks for reaching out. It is difficult to really give any feedback without more information. Is this an ongoing condition? How long has it been happening? Why is one of our Orfe resting with his back out of the water? It is one of 10 and about 8 years old. We live in the UK and the temperatures are between 0c and 10 at the moment. I have 7 blue Orfe. All are around 12 years old. They are between 12-18 inches long now. Unfortunately, one has a kinked spine which I believe is relatively common in these fish although the rest are fine at the moment. He is also now swimming upside down at times although on occasion is able to be upright. Not sure what to do with him. I feel stressed watching him so doing a partial water change as I write. Tried to feed him shelled peas as I heard this was good for digestion. He took some yesterday but no improvement. Tried a salt bath too. Not sure whether to put him our of his misery or try and help him through it. Any thoughts Mike? Have possibly 300 ish in large pond. Hungry monkeys but only like flakes and some of the pellets are to big for them. Also like mealworms. Needs to reduce numbers as there are now too many in the pond. In the north of Scotland. I put four 4-inch orfe in my 3500 gal pond in Aug. 2016. I live in Michigan, USA and we get brutal winters. All 4 appeared this Spring and were in great shape. Even grew amazingly well and are between 5 and 5 1/2 inches each now. I am getting 2 more today to help ensure the egg and baby population stays low in my pond. I have 30 large goldfish of which 10 are female and they produce hundreds of babies of which too many survive. I went from 40 to almost 200 in the past 3 years. Almost all the fry seem to make it to maturity in my pond (6000 gallons). Wonderful fish, just a pity they are too fast to catch and are rapidly maxing out the pond. My one and only golden orfe is now 35 years old!! 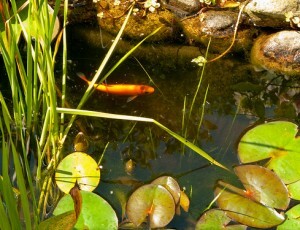 Has been in pond with 4 koi carp since a baby , but now is not moving much and I fear I’m gong to lose him soon. The koi carp are the same age!!! i would love to keep golden orfe in my pond but i’m keeping a lot of small fish like rosy reds and bitterlings. Would they be safe? Thank you for sharing your information. It is interesting to hear how well they do in such extreme conditions! (your english is fine!!) Cheers. Very interesting site. Have five of them in our pond, they are the clowns in water. Always something going on. We live i Sweden and have pretty strong winter here, -20 celcius. And the Golden Orfe has no problems with that. They make it together with the Koi and Golden fish. Sorry about my English.